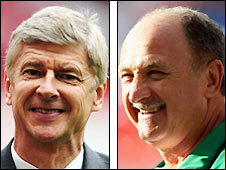 Arsenal manager Arsene Wenger believes new Chelsea boss Luiz Felipe Scolari will be a welcome addition to the Premier League. Scolari replaced Avram Grant at Stamford Bridge and Wenger is relishing the challenge of facing the Brazilian. "I like Scolari as a person. I like him as a coach and I think he has charisma. He will add something to the Premier League," said Wenger. "You never know what will happen but he is a quality man, a quality manager." Arsenal finished third behind Manchester United and Chelsea last season and will not face the Blues in the new Premier League season until November. Wenger said that he has a good relationship with Scolari and believes his rival will employ the same system as previous managers Grant and Jose Mourinho. He said: "The system he plays looks similar to the 4-5-1/4-3-3 system that Chelsea play. Whether it is down to the fact that they have similar strikers, I don't know. "There will be a change, because every manager brings his own personality and he will buy players, but the system won't change." Scolari was appointed while the 59-year-old was still in charge of Portugal at Euro 2008 and Chelsea have come under fire from the Portuguese Football Federation over the timing of the announcement. I'm looking forward to seeing how Scolari does. Portugal have since been eliminated by Germany in the quarter-finals and Wenger questioned the timing of the appointment. He said: "What's for sure is that it didn't give anything to the team, so it could only take something away. It didn't help Portugal. "France had that situation in 2004 when (Jacques) Santini announced he was going to Tottenham. Once that happens all you hear is 'who will be next?' That starts in the camp as well."